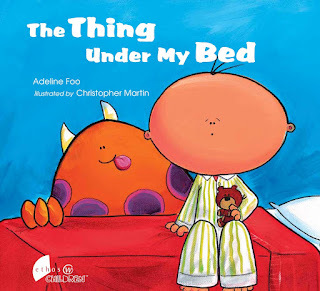 Adeline Foo writes to us re a picture book she wrote in 2009 that she feels has not had the attention it deserves, as she was busy promoting Amos Lee when it came out. See the website of illustrator Chris Martin, who travels through Singapore from time to time, according to Adeline — so available for possible school visits. Buster loves snacking just before bedtime. Take a peek under his bed and you’d find crumbs, discarded wrappers and half-eaten bits of food. One night, Buster hears strange noises from under his bed! ‘Grrrllll’… a stomach growls hungrily, ‘tsk, tsk, tsk’… fingers scratch impatiently, ‘tek-ca-toh, tek-ca-toh, tek-ca-toh’… feet drum menacingly, and ‘cssshhh, cssshhh, cssshhh’… a tongue sloshes around looking for food! Is there a monster under the bed? Is Buster safe? Read this story and have a good laugh at what’s really making all those dreadful noises!